Busselton is a city in the South West region of Western Australia. At June 2018 Busselton had an estimated urban population of 38,921. Founded in 1832 by the Bussell family, Busselton is 220 km (140 mi) south-west of Perth, the capital of Western Australia. Busselton has been voted Western Australia's top tourist town in 1995, 1996, and 2005. The new Busselton skatepark was built December, 2015. It has attracted more tourists and competitions. The early history of European exploration of the Busselton area focused on the French expedition of 1801 which brought Nicholas Baudin, with his ships the Géographe and Naturaliste, to the coast of Western Australia. Baudin named Geographe Bay and Cape Naturaliste after his vessels, and named the river Vasse after a sailor, Thomas Vasse, who was lost as he went overboard and was believed to have drowned. Busselton was one of the earliest settlements in Western Australia. It was first settled by the Bussell family, who relocated there from their location on the Blackwood River after John Garrett Bussell discovered superior farm land in the area. The Bussells moved to the area in 1834, establishing a cattle station which they named Cattle Chosen, which quickly became one of the most prosperous stations in the colony, and as a result, nearly all of the settlers at Augusta relocated to the area within a few years. A number of settlers established themselves at Wonnerup, and eventually a contingent of troops was stationed there under Lieutenant Henry Bunbury. It was originally intended to locate the townsite at Wonnerup, but the area was low-lying and marshy, and Bunbury considered it unsuitable for a townsite. The present area was then recommended by the Surveyor General, John Septimus Roe. The present name of Busselton derives from the Bussell family. It was first officially used in June 1835. The Bussells, who were not consulted about the name, preferred the name Capel after a relative in England, Capel Carter, but the name Busselton was retained. A town named Capel was later established to the north of Busselton. Being in close proximity to the tall timber country, Busselton soon established itself as a leading port. In 1850, timber was being exported and the small town prospered. Jetties for this purpose were built at Wonnerup, Busselton, and Quindalup. Of these, only the Busselton Jetty remains. During World War II, 476 Busselton-born men signed up for service; 20 in the Royal Australian Navy, 110 in the Royal Australian Air Force, and 346 in the Australian Army. The names of the fallen are displayed on the town's war memorial alongside those of World War I in St Marys Park. During the war, Busselton was home to an Air Force training base; remains of the base can still be seen today from the Busselton Bypass Road. A Royal Australian Air Force P-51 Mustang fighter was given the nickname Busselton in honour of the people of Busselton and their support of War Loan fundraising activities. Western Australia's first railway line was built just north of Busselton at Lockville in 1871, the original engine known as the Ballarat engine is on display near the tourist bureau. The privately owned line was used for the transport of timber to the Wonnerup jetty across the Ballarat bridge, which was later converted to a pedestrian bridge and removed in 2004 to allow for the replacement of the nearby Vasse Floodgates. From about 1927 to 1957, Busselton was also on the Western Australian Government Railways railway line running from Bunbury to Flinders Bay. Following the closure in the 1950s of the Flinders Bay branch, most of the old line formation was changed in ownership. The railway line also connected onto the Busselton Jetty and was not closed on the jetty until the 1970s. The connection with Bunbury was closed in the late 1980s. Busselton has a town bus service run by South West Coach Lines, with three routes. South West Coach Lines and Transwa provide coach services for connections to other south west towns and Perth. Virgin Australia Regional Airlines (formerly Skywest) has provided (in the past) a weekend service to Busselton from Perth with flights being 45 minutes in duration. There were three return flights a week using Fokker 50 aircraft. 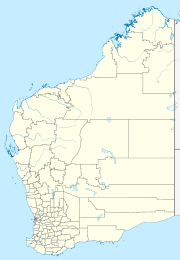 It is the northernmost Australian coastal town entirely with a warm-summer Mediterranean climate (Köppen: Csb). Residents and visitors enjoy moderate temperatures, with a typical maximum temperature of 22 °C and a minimum of 11 °C. The summers are generally hot, with an average daily maximum of 28 °C (82.4 °F) with cooling afternoon sea breezes, and a winter that delivers cooler temperatures; 8 to 18 °C (46.4 to 64.4 °F) and rain that supports diverse agricultural industries, including a world-famous grape-growing region. The annual average rainfall for Busselton is 864 mm, with the wettest period being from May to September. According to the Australian Bureau of Statistics, the shire had a permanent resident population of 25,950 in 2004 with the town of Busselton accounting for 67% or 17,400 of the total. The shire's permanent population is expected to continue to increase significantly to about 34,000 in 2011 and 46,000 in 2021. According to the Australian Bureau of Statistics, during the year 2004/2005, Busselton's growth rate for the 12-month period was 6.5%, bringing 1700 new residents to the shire and increasing the population to an estimated 27,546. In 2012, Busselton gained city status. Busselton's growth over the past decade has been centred along the shores of Geographe Bay; this has created a narrow urban strip 15 km (9.3 mi) long and around 1 km (0.62 mi) wide. The heavy coastal development has led to a shortage of beachside blocks. Many sites of interest are in the Busselton region. Busselton Beach is known for the turquoise-coloured, tranquil waters and white sands. Busselton is home to the longest wooden jetty (pier) in the Southern Hemisphere, stretching almost 2 km out to sea. Construction of the jetty began in 1853 and was continually extended until the 1960s, when it reached its current length of 1841 m. It was closed to shipping in 1972, and maintenance was discontinued for a time. Following major damage caused by Cyclone Alby in 1978 and a fire in 1999, it was restored and improved. Since 2003, the jetty has offered visitors a tourist train ride, an underwater observatory, and an interpretive centre. The current Wonnerup House was built in 1859 by the Layman family (original settlers). The original building built between 1837 and 1841 was destroyed by fire in 1858. The complex also includes the dairy and kitchen, which antedate the main house (and survived the fire of 1858 because they were separate buildings). Over the road are the Teacher's House (1885) and School (1873). Since 1973, the National Trust of Australia has operated the property as a museum open to public. St Mary's (Church of England), built in 1844–1845, is allegedly the oldest stone church in Western Australia. John Molloy and John Garrett Bussell were the main forces behind the construction of the church. The church was not consecrated until 1848 and a clergyman was not attracted to the region for another decade. Alongside the church is a graveyard; some of the graves date back to 1841 - before the building of church. Ithaca (formerly known as Villa Carlotta) is located at 110 Adelaide St, Busselton, and was built by Frank Backhouse in 1896. Ithaca is listed on the state's Register of Heritage Places in recognition of its significant historical and community values. Ithaca has a two-storey tower and was originally built as a private residence; in 1904, Ithaca was acquired by Sisters of Our Lady of the Missions for use as a Catholic convent. Subsequently, it has been a school and a hotel, and now is a motel. Weld Hall located on the corner of Queen and Adelaide St was built in 1881. In August 2001, the Western Australian government announced that Weld Hall had been listed on the Register of Heritage Places in recognition of its significant historical and cultural value to the local community. The hall is a single-storey brick building with a galvanised roof, and is constructed in a simplified Victorian Italianate style; it is one of the oldest remaining structures in the town. The trail retraces the Pioneer Route from Augusta to the Vasse taken by the original settlers in the 1800s. It is over 100 km long, starting at the jetty and finishing in Augusta. Busselton is served by Busselton Regional Airport. Primary schools in the Busselton area include Busselton Primary, West Busselton, Cornerstone Christian College, Dunsborough Primary, Geographe Primary School and Education Support Centre, Georgiana Molloy Anglican School, Our Lady of the Cape, St. Joseph's, and Vasse Primary. High schools in the area include Busselton Senior High School (years 8-12), St Mary MacKillop Catholic College (years K-12), Cornerstone Christian College (years K-12), Georgiana Molloy Anglican School (years K-12), Cape Naturaliste College (years 8-12). The only tertiary institution in the area is the South Regional TAFE. Busselton District Hospital is located 3 km west of the town centre. A new hospital has been announced by the state government, with completion expected in 2014. Facilities of the new hospital will include 64 overnight and 20 same-day beds, a new renal unit, two operating rooms, and an expansion of the emergency department. Busselton is served by two local weekly newspapers; the Busselton Dunsborough Mail (Wednesday) and the Busselton Dunsborough Times (Friday). The West Australian is available from Monday to Saturday and the Sunday Times is available on Sundays. Busselton is serviced by three commercial television channels, GWN7, WIN, and Nine. The public-broadcast channels ABC and SBS are also available. Although properly Busselton is the only city in its local government area (the City of Busselton), other important townships include Dunsborough, Yallingup, and Vasse. The nearest city to Busselton is Bunbury, which is 53 km away. Busselton is located in the 1,454 km² City of Busselton, which is home to 28,000 people (2005 est.) and also includes the towns of Dunsborough, and Yallingup. Busselton is located in the Lower House seat of Vasse, represented by Libby Mettam (MLA), who holds the blue-ribbon seat for the Liberal Party. In the Upper House, Busselton is within the South West Region. Busselton is located in the safe Liberal seat of Forrest. The seat is currently represented by Nola Marino, who has held the seat since 2007. Busselton is the location of one of the longest-running epidemiological studies in the world. Since 1966, over 20,000 residents of Busselton have participated in surveys concerning such health topics as cardiovascular disease, pulmonary function, diabetes, and allergies, resulting in over 450 publications. The program was initiated by Dr Kevin Cullen, and is administered by Busselton Population Medical Research Institute (BPMRI) and the School of Population and Global Health, University of Western Australia. The Busselton Health Studies have been described as a national treasure and continue to provide important information about the prevalence and risk factors of many common diseases and health conditions. ^ a b "3218.0 – Regional Population Growth, Australia, 2017-18: Population Estimates by Significant Urban Area, 2008 to 2018". Australian Bureau of Statistics. Australian Bureau of Statistics. 27 March 2019. Retrieved 22 April 2019. Estimated resident population, 30 June 2018. ^ "Inperth Travel Guide - South West Region". 2002. Archived from the original on 19 July 2008. Retrieved 27 September 2008. ^ "Busselton Family History - Local History". 2009. Retrieved 28 August 2010. ^ "My Busselton - Historical Attractions". 2002. Archived from the original on 16 February 2011. Retrieved 11 September 2010. ^ "Shire of Busselton - History". 2006. Archived from the original on 2 January 2011. Retrieved 28 August 2010. ^ "Interactive Australia / New Zealand Koppen-Geiger Climate Classification Map". www.plantmaps.com. Retrieved 6 March 2019. ^ "Climate statistics for Busselton". Australian Bureau of Meteorology. Retrieved 3 November 2014. ^ Bennett, Rob (25 January 2012). "Busselton is a city!". Busselton Mail. Archived from the original on 1 February 2012. Retrieved 26 May 2012. ^ "Welcome to Western Australia - Busselton Jetty Experience". 2008. Archived from the original on 16 July 2011. Retrieved 14 December 2008. ^ Stirling, Ros. "Wonnerup: a chronicle of the south-west". Australian Heritage magazine. Archived from the original on 25 May 2011. Retrieved 21 April 2011. ^ Burton, Alfred (1941). Church beginnings in the west. J. Muhling printer. p. 39. Retrieved 6 April 2017. ^ "Sydney Morning Herald - Travel - Busselton". The Sydney Morning Herald. 17 January 2008. Retrieved 11 September 2010. ^ "Register of Historic Places 00386 - Villa Carlotta". 1999. Retrieved 17 June 2016. ^ "Weld Hall (Place ID 9492)". Australian Heritage Database. Department of the Environment. Retrieved 11 September 2010. ^ "St Mary MacKillop College". St Mary MacKillop College. Retrieved 6 April 2018. ^ "South Regional TAFE -". www.southregionaltafe.wa.edu.au. Retrieved 6 April 2018. ^ Bennett, Rob (22 August 2012). "Hospital contractor selected". Busselton-Dunborough Mail. Retrieved 8 August 2013. ^ "Forest Rally – 27th – 29th April 2018". forestrally.com.au. ^ "Make Smoking History Forest Rally". www.rally.com.au. ^ "Rally WA – Western Australian Rally Championship". new.rallywa.com. ^ "Delirium - 24 Hour Cycle Race". delirium24.com. ^ "CinefestOZ Film Festival Western Australia - CinefestOZ". www.cinefestoz.com. Retrieved 6 April 2018. ^ "Busselton Jetty Swim -". busseltonjettyswim.org.au. Retrieved 6 April 2018. ^ Australia,, The University of Western. "Busselton Health Study". www.sph.uwa.edu.au. Retrieved 6 April 2018. Shann, Edward O. G. (1926) Cattle Chosen. Oxford University Press, London. Republished in 1978 by University of Western Australia Press, Nedlands, Western Australia. ISBN 0-85564-138-X. Wikimedia Commons has media related to Busselton, Western Australia.